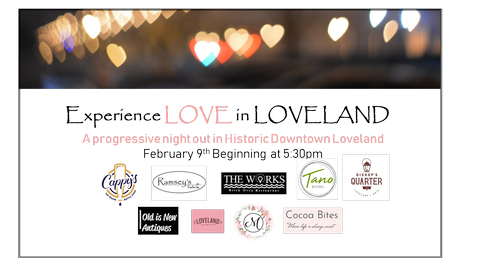 Experience LOVE in Loveland. A progressive night out in Historic Downtown Loveland beginning at 5:30pm. Treat your special someone to a unique experience in the land of love. Two packages to choose from. One LOVE to celebrate - YOURS. Various restaurants/entertainment venues in downtown Loveland, OH. Vow renewal begins at 5:30pm with progressive dinner events to follow. ** Check in begins at 5:15pm near Fountain Greene - logistics and instructions for evening included. Celebrate your love with a special offer from Old is New Antiques! $50 Gift Card available to create your custom sign and remember the night! A special offer from Nothing Bundt Cakes also included! Coupon for a single tower bundlet will be in the goodie bag! It just keeps getting sweeter!